Fovea specializes in helping campuses achieve ambitious goals for transforming their campus facilities and energy systems. Our road maps provide your decision makers with the right level of detail, enabling your campus to set goals that are both ambitions and achievable. Your campus can clearly articulate why you have chosen a given path (and why not something else) giving you confidence in your strategic direction. Fovea’s road mapping services will give you a first critical step to quantify, organize and prioritize your response to your campus’s strategic challenge. Fovea offers 2 pre-defined facilitated planning processes using Fovea’s iterative planning process. Fovea’s Climate Action Planning Process provides your campus with an integrated planning framework to reducing or eliminating your campus’s Greenhouse Gas (GHG) emissions. Using the Fovea Reporting Framework, Fovea will help you isolate and specifically quantify the sources of your GHG emissions now and into the future. 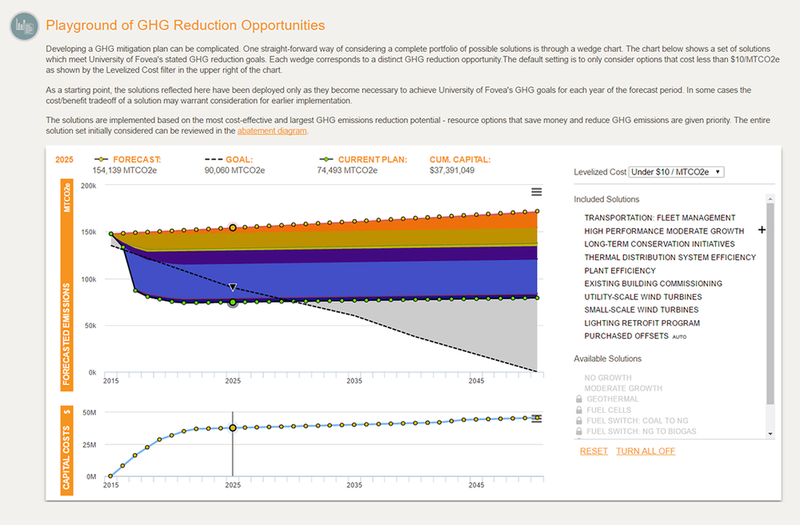 The forecast model is based on your reported GHG emissions, historical fuels and utilities purchases as well as your location-specific commodity pricing. We help you craft forecasts of your annual fuel usage and utility consumption based on your campus growth and renovation plans. We facilitate the identification of carbon mitigation strategies based on input from your stakeholders and leveraging our experience working with dozens of other campuses around North America. We then work with your team to model the likely impacts of each strategy on your future GHG emissions, energy demands, required capital investments and operational costs. The Fovea CAP model allows you to combine various combinations of solutions into an integrated portfolio, so you can see the aggregate impact of your overall plan. You can quickly share the outputs of your planning efforts with a broad group of stakeholders via a web-based report. New reports can be generated at any time with the drag-and-drop of a file allowing your team to continuously improve your plan with each iteration. Fovea’s Utility Business Planning Process provides your campus with an integrated decision environment to consider the major components of your campus energy infrastructure. Fovea will help your campus create a “Business-as-Usual” forecast of your campus growth, commodity purchases, reliability plans and a major equipment replacement. The Utility Business Plan model matches your future energy assets with your drivers of demand to output a robust set of key metrics. Using the Fovea Reporting Framework, you will be able to run “what-if” scenarios to test, visualize and guide your strategic infrastructure decisions. Fovea provides support for campuses with Greenhouse Gas (GHG) reporting requirements. If your campus is a Second Nature Climate or Carbon Commitment signatory, Fovea can help you with data collection, emissions calculations and the annual progress evaluation submission process. We offer service packages ranging from quick planning-level estimates to detailed deep-dive, fully-documented inventories.